My favorite method for how to cook steak in the oven. Steak is surprisingly easy to prepare and cook in the oven to your desired degree of doneness, and just as delicious as ever! One of the random downsides about our apartment here in Barcelona? We’re not allowed to have a grill. I actually eat very little meat nowadays, and try to reserve it more for just special occasions. But when I do go for it, my favorite protein will probably forever and always be a nice, juicy, perfectly-cooked steak. What can I say — I was raised in the Midwest and still love a good meat and potatoes meal every now and then. Especially when the steak is organic and grass-fed. Especially when it’s well seasoned. And — since steak is already a special occasion food for me anyway — especially with a generous melty pat of butter on top. Total treat. That said, after cooking steaks on the grill my entire life, I will be the first to admit that I was very skeptical that steak could be cooked properly in the oven. But as it turns out, it actually works really well! It nails that perfectly seared and crispy crust on the outside, and still lets you choose your desired degree of doneness on the inside. It’s only takes about 10 minutes to make, and it’s easy to customize with your favorite seasonings or steak marinades. And hey — during those cold winter months — it’s a comfortable way to cook steak from the comfort of your kitchen, instead of having to bundle up and go outside. A win-win-win in my book. So let’s do it! 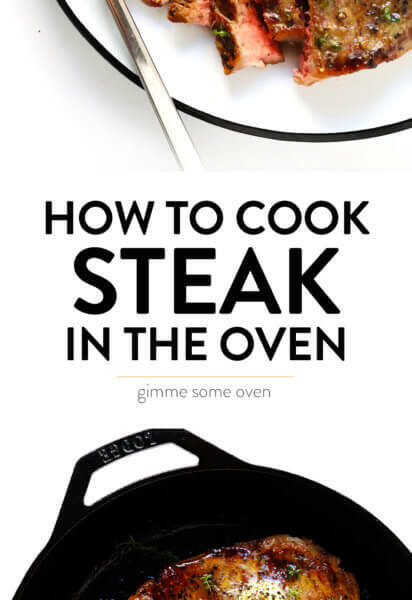 Let’s talk all about how to cook steak in the oven. Good-quality: It’s important to me that any beef I buy is organic, grass-fed, and sustainably-raised. It’s more ethical, plus always tastes better. Your preferred cut: I recommend filet mignon, rib-eye, T-bone, flank steak, sirloin, strip steak, or whatever your favorite cut of steak may be. Seasonings: I typically like to use a simple garlic powder, salt (or seasoned salt) and black pepper seasoning blend with steak. And then serve it up with a pat of butter and maybe a sprinkle of fresh thyme. But feel free to use whatever other dry seasonings or steak marinades that you prefer. An oven-proof skillet: I highly-highly-highly recommend using a cast-iron skillet (or a cast-iron Dutch oven) if you have one. It will hold heat the best and cook the steak most evenly. But if not, any oven-proof skillet that can sustain high heat will also work. Tongs: These will be essential for flipping the steak as it is searing. I recommend these 12-inch tongs from OXO. 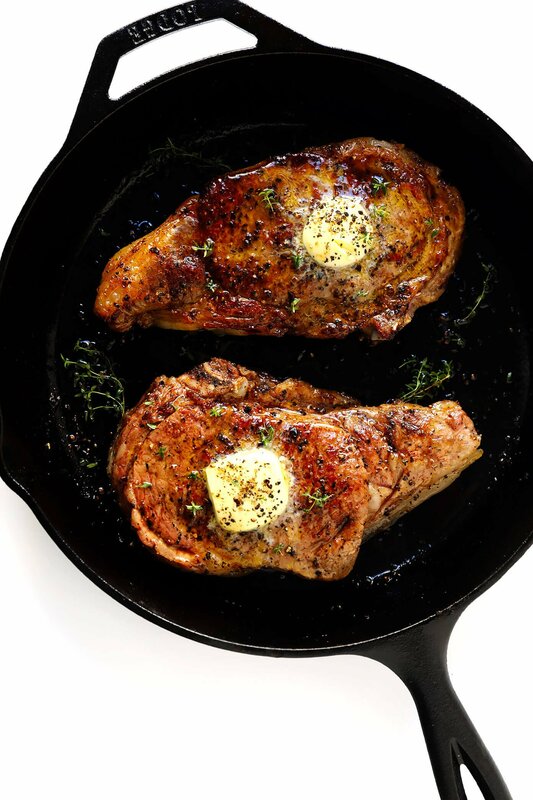 They keys to cooking steak in the oven are pretty simple: you need to begin with room temperature steak, sear it in a screaming hot skillet, broil it the rest of the way in the oven until it reaches your desired level of doneness, and then let the steak rest for a few minutes to lock in those juices. As I mentioned above, I also really, really recommend using a cooking thermometer to measure the internal temperature of the steak and ensure that it has reached your desired level of doneness. It will be a huge help, especially if you’re picky about the exact level of doneness. Begin with room-temperature steak. Let it rest out on the counter for 30-45 minutes or so, until it comes fully to room temperature. This is always essential with cooking any kind of steak. Near the end of this time, go ahead and preheat the broiler on your oven. **Also, one important note — the steak will definitely be very smoky as it is cooking! So be sure to turn on an exhaust fan above your stove (if you have one) or open a window. 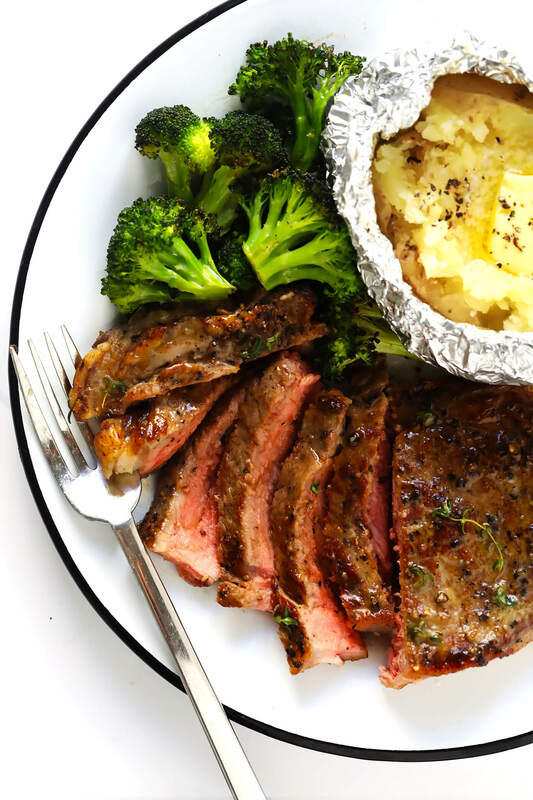 When it comes to steak seasoning, I’m a big fan of the simple garlic powder/salt/pepper mix in the recipe below, which goes with just about any cuisine. (Or I also really love subbing in seasoned salt in place of regular kosher salt.) But if you’d like to mix things up, feel free to sub in any of your favorite dry seasoning mixes. 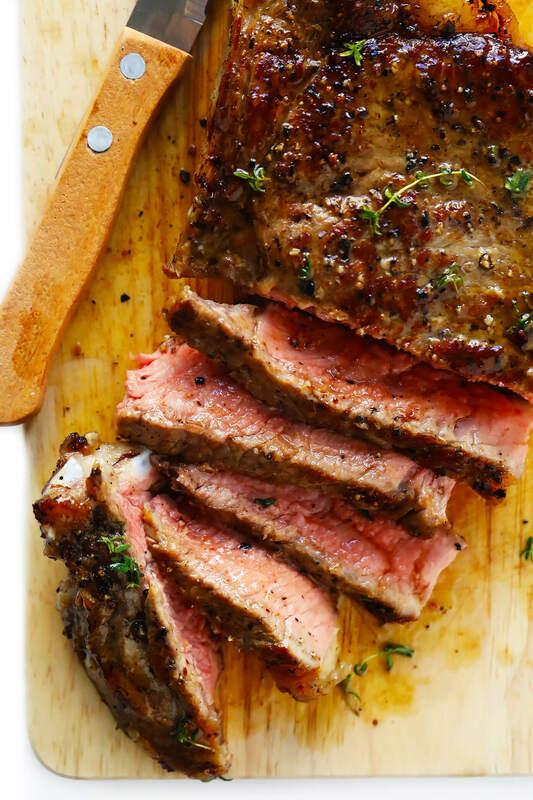 Or check out these 5 easy steak marinade recipes. And of course, feel free to also serve your steak with any favorite finishing sauces as well. My favorite method for how to cook steak in the oven. 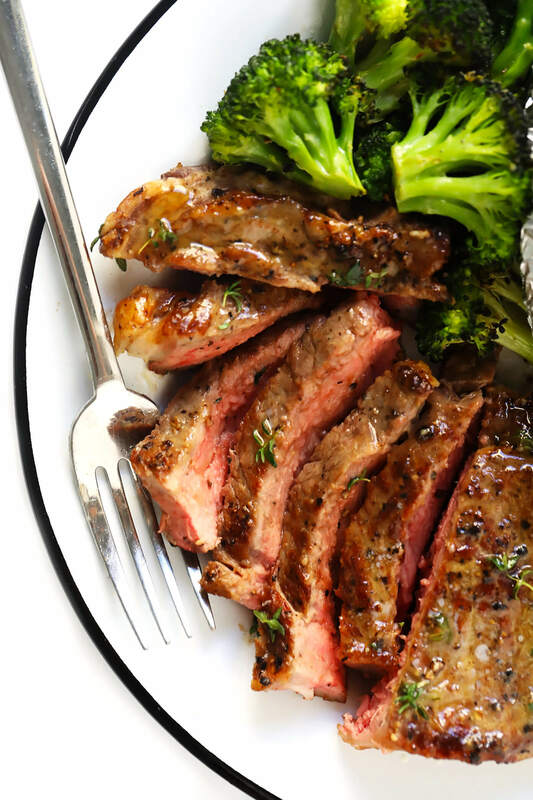 Oven-broiled steak is surprisingly easy to prepare and cook to your desired degree of doneness, and just as delicious as ever! Preheat broiler on your oven. Let the steaks rest on a plate until they have fully reached room temperature. In a small bowl, whisk together the salt, pepper, and garlic powder until combined. Set aside. Blot the steaks dry with paper towels. Then brush evenly on both sides with oil, and sprinkle the seasoning mixture evenly on both sides of the steaks. Meanwhile, heat a cast iron skillet (or oven-safe sauté pan) on the stove over high heat for 6-8 minutes. 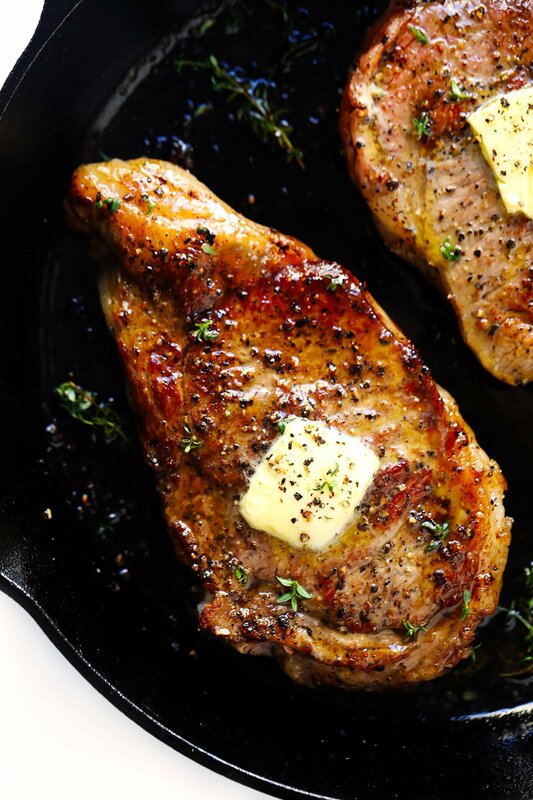 Once the pan is super-hot, add the steaks and use a spatula to press them evenly into the pan, so that the entire bottom surface of the steaks makes contact with the pan. Cook for 30 seconds. Carefully use tongs to flip the steaks. Then use an oven mitt to carefully transfer the skillet to the oven. Broil for 3 minutes. Then flip the steaks once more, and continue baking for 2-3 minutes more, or until the internal temperature of steak reaches 5 degrees below your desired level of doneness (see chart below). The steak will continue cooking a bit after you remove it from the oven. Once the steaks are ready to go, immediately remove the pan from the oven, and transfer the steaks to a clean plate. Brush any of the pan juices onto the steak. 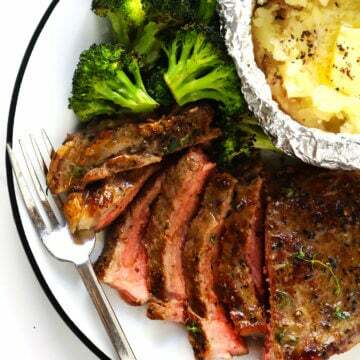 Then loosely tent the plate with aluminum foil and and let the steak rest for at least 3 minutes. The FDA recommends that steak be cooked to an internal temperature of 145°C or 63°C.